Home / About Us / Our Providers / Julie Johnson, M.D. Julie Johnson, M.D. joined Desert Orthopedic Center in 2016 as an orthopedic foot and ankle specialist. Dr. Johnson formerly practiced in Fargo, North Dakota, but as a native Nevadan, she is happy to return to the West Coast after 10 years living across the country. Dr. Johnson graduated from Santa Clara University. She returned to Nevada earning her medical degree from the University Of Nevada School Of Medicine. She completed her residency training in orthopedic surgery from GRMEP/Michigan State University in Grand Rapids, Michigan. 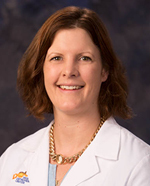 Following her residency, Dr. Johnson completed her fellowship in foot and ankle surgery at the Warren Alpert School of Medicine at Brown University in Providence, Rhode Island. Dr. Johnson is a member of the American Medical Association, California Medical Association, American Academy of Foot and Ankle Society, and the American Academy of Orthopedic Surgery. She is also a diplomat of the American Board of Orthopedic Surgery. Dr. Johnson remains engaged in education and advocacy. She is the past president of the First District North Dakota Medical Association and has served on committees for the AOFAS, hospitals, and medical associations alike. She testified at the North Dakota Legislature to further the quality of foot and ankle care. Dr. Johnson’s high quality care is her focus and she has been awarded the CG-CAHPS award for excellence in patient care. Dr. Johnson is passionate about maintaining and restoring foot and ankle health. She is thrilled to be a new resident of the desert with her husband and daughter, and the diverse culture, strong community, and beautiful weather are ideal. She enjoys trail running, hiking, golf, cycling, and yoga. "The feet and ankles are the foundation for the entire body."